Apple Inc. is the corporation that has comforted the users to the pinnacle of comfort. Everything is just a click away with swift actions unknown to the user, running at the backdrop. The email, which is listed in the daily responsibilities of the user, is perfectly made in this platform. 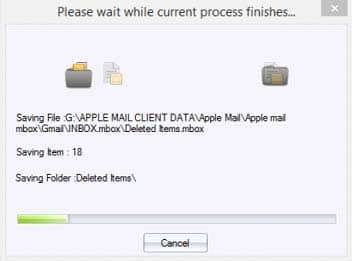 For ease the Apple Mail composes the emails and sends it through SMTP, receives it through IMAP and maintains end-to-end communication through S/MIME. Even being the perfect email platforms for the professionals, sometimes professionals faces obscure problems while migrating the files from older version to newer one i.e. platform upgradation. However, experts do always recommend to take backup prior initiating the upgradation process. 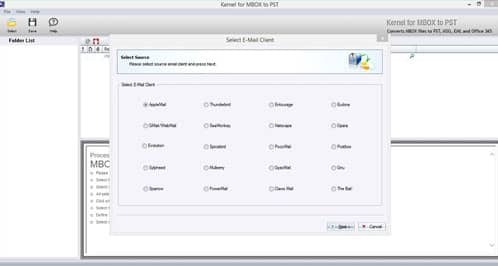 There is a suitable method of using a proficient third party MBOX to PST conversion tool that works promptly in the direction of migrating MBOX file and its items to PST file. On ‘Select E-Mail Client’ click on Apple Mail followed by Next button. 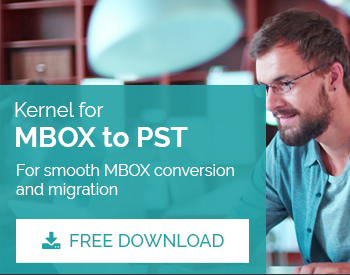 To add the MBOX file that need to be converted into PST, click Add File(s). On adding the concerned MBOX file(s), click Finish. 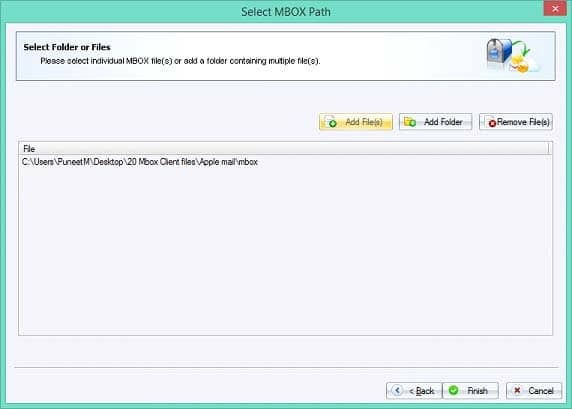 Once the process is finished, the MBOX emails will be presented on the screen. 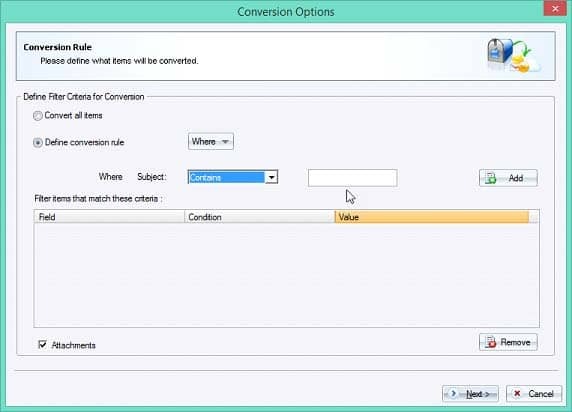 To save the MBOX emails in Outlook PST, click Save Button, and window of Conversion Options appears displaying different options. Based on your requirement, click on any of the radio buttons mentioned under ‘Define Filter Criteria for Conversion’. and click on Next button to proceed. Click ‘Define Conversion Rule’ to define the filter criteria and perform selective items migration. 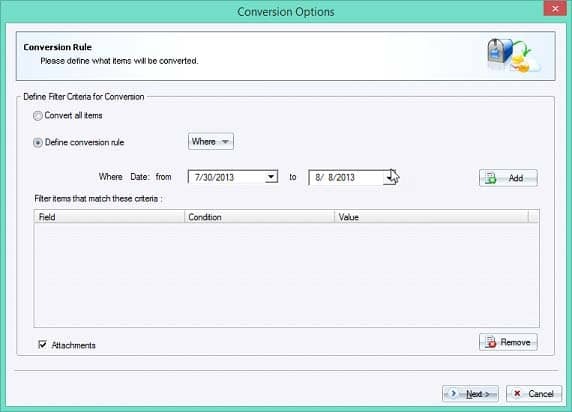 Select ‘Define Conversion Rule’ to make the selection of appropriate field. In the Where field, four options are available - From, To, Subject and Date. In ‘From’ field mention the value which is either contained or not contained in the From attribute of the email item. In ‘To’ field mention the required specifications in the To field. In this field, user can specify the date range in the From and To sub-fields. Once the date range is confirmed, the tool displays all the items present in that date range. Click Add button to add filter criteria to the list. Note: The tool also gives choice to remove the defined criteria, just click the Remove button to remove a defined filter. As per the need, select the "Attachments" checkbox if you require to convert all the email items along with attachments. After that click Next. As a new window opens with different saving options like PST, MSG, EML and Office 365, select ‘Save in PST’ to export and save the selected items in Outlook PST file format. 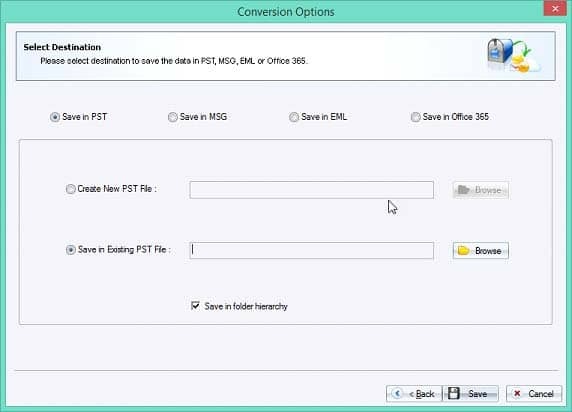 Note: Here you have the option to choose either ‘Create New PST File’ or ‘Save in Existing PST File’. 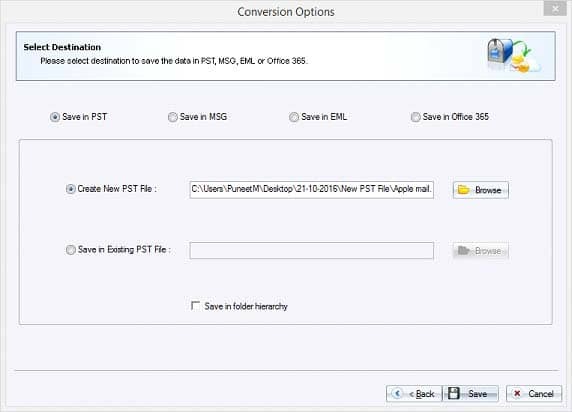 To create a new PST file, select "Create New PST File" option and Click Browse button to provide the destination of newly-created PST File. 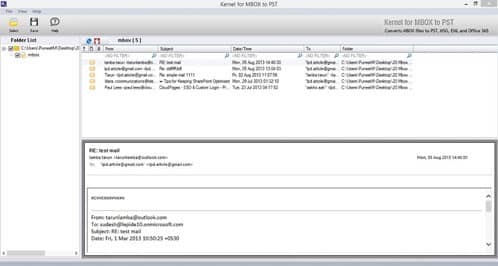 To save file in an already-existing PST file, select "Save in Existing PST File" option, and click Browse button to provide the location of an already-existing PST file. Click Save button to save the converted email data. 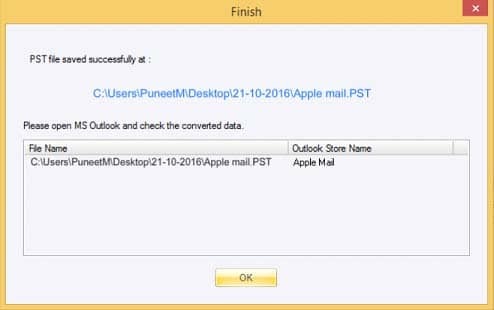 Upon successful completion of conversion process from MBOX file of Apple Mail to PST, the window appears displaying the complete location of PST file where it gets saved.